“You’ll have to be up early to catch the sunshine tomorrow because it will cloud over quite quickly during the morning” said the local weather man last night. He was spot on with that, although he made no mention of the rain which also came with it. 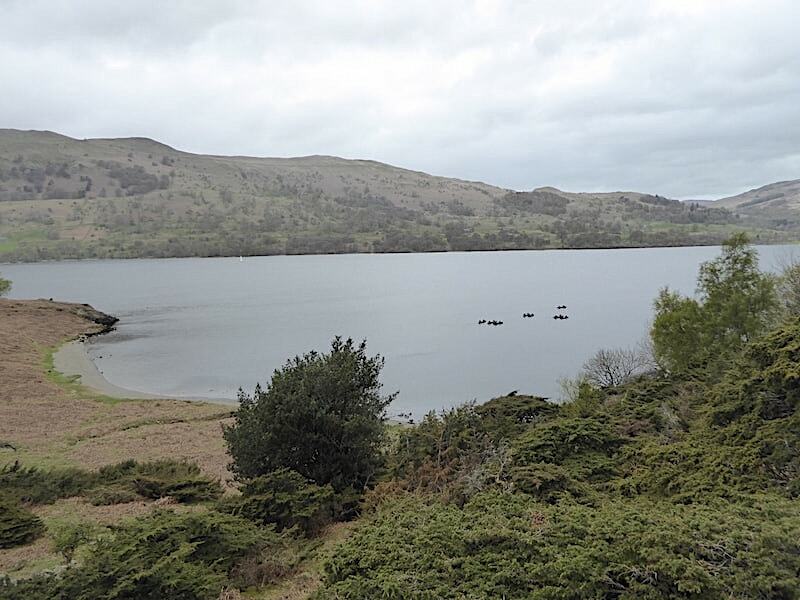 Knowing it would be a poor day we chose not to take a walk on any fells and opted for a lower level walk along a section of the Ullswater Way from Howtown to Glenridding. Its a route we’ve walked before but simply as a return route to Glenridding from a walk up Place Fell, but at seven miles long and with plenty of variety it stands out well enough to be a walk in its own right We started from Glenridding and took a boat trip over to Howtown from where we began the seven mile walk back along the undulating route above the shoreline. 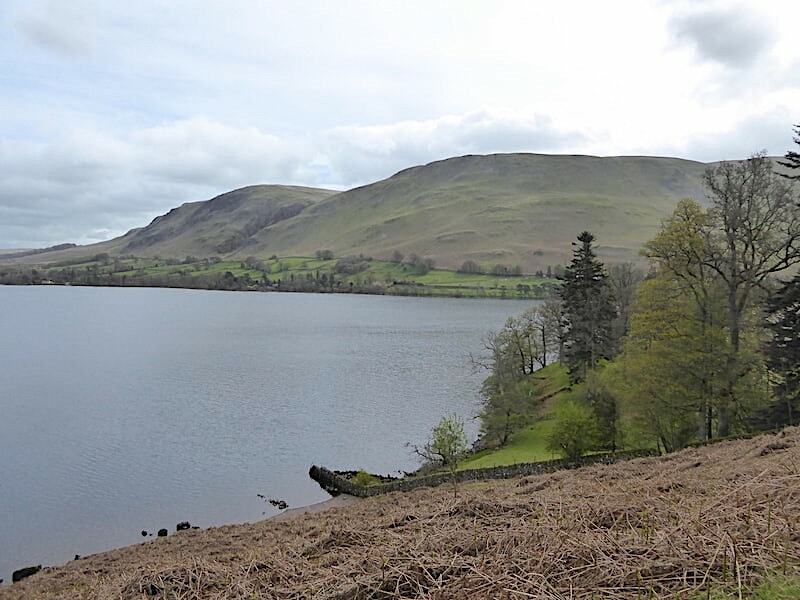 Despite living so close to Ullswater its almost four years since we took a boat trip on it and another one is long overdue, so we’re looking forward to a relaxing half hour’s worth of sailing before we begin today’s walk. 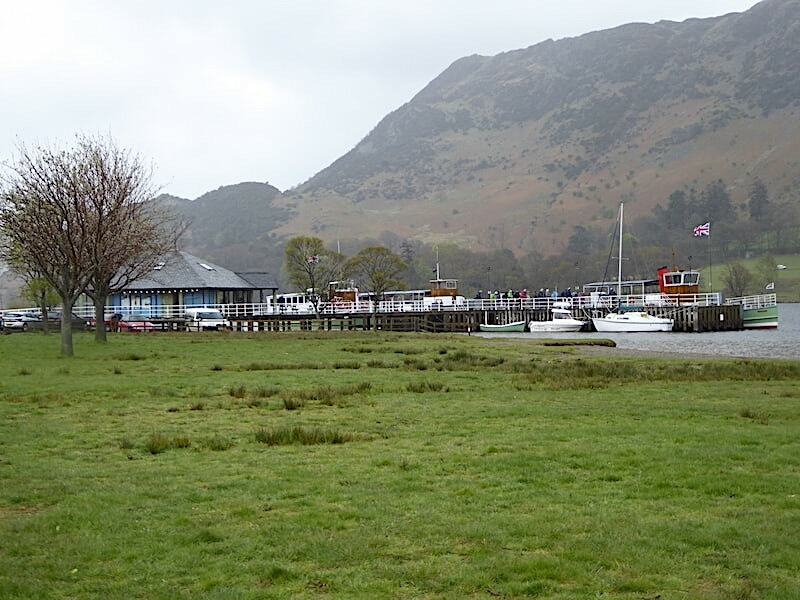 We arrive at Glenridding Pier in good time for the first sailing of the day at 10.00 am and while the parking meter gobbled up our cash I took this shot looking north along the water. 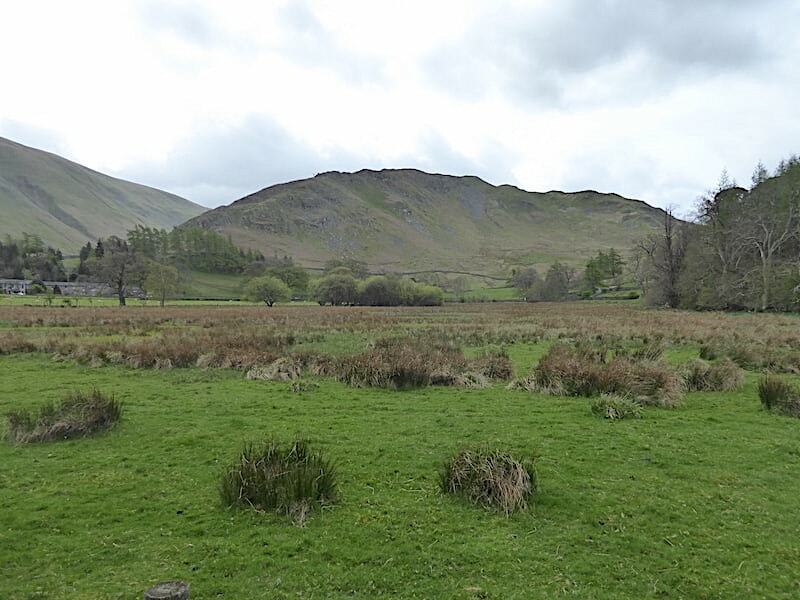 On the extreme right is one of the subsidiary tops of Place Fell, Birk Fell, and below that is Silver Crag, although not looking at all silvery today. A large coach was just pulling into the car park as we began making our way to the ticket office eventually off-loading a very large group of passengers. That spurred us on to get the tickets bought rapidly, finding out as we did so that a 10% discount was given to passengers buying tickets for the first sailing of the day. A pleasant surprise which sweetened the parking meter pill somewhat. 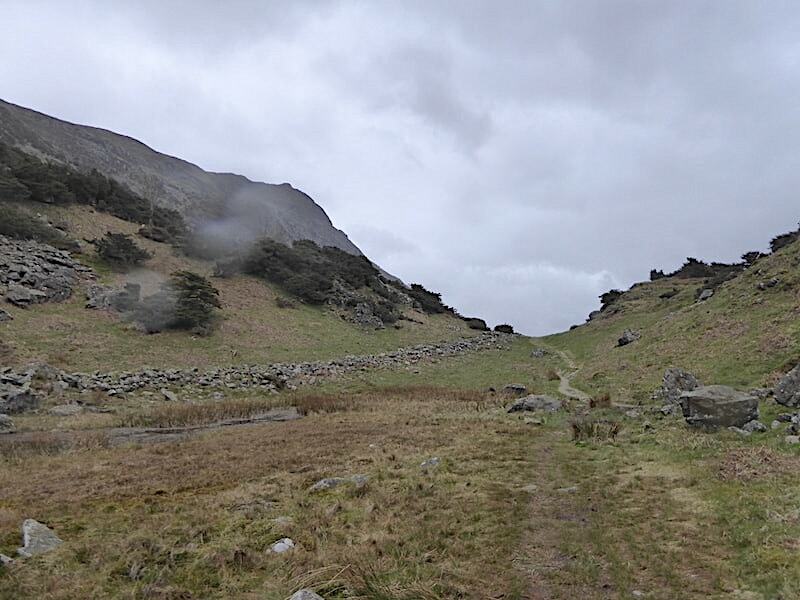 As we all waited to get on board we could see the cloud rapidly approaching from the Kirkstone Pass to the south of us so we knew that the bright weather above us was already going to be pushed away eastwards. There were lots of people on the boat and with passengers standing here, there and everywhere I didn’t bother taking any photos during the trip to Howtown. The cloud was already above us by the time we reached the jetty at Howtown thirty five minutes later. 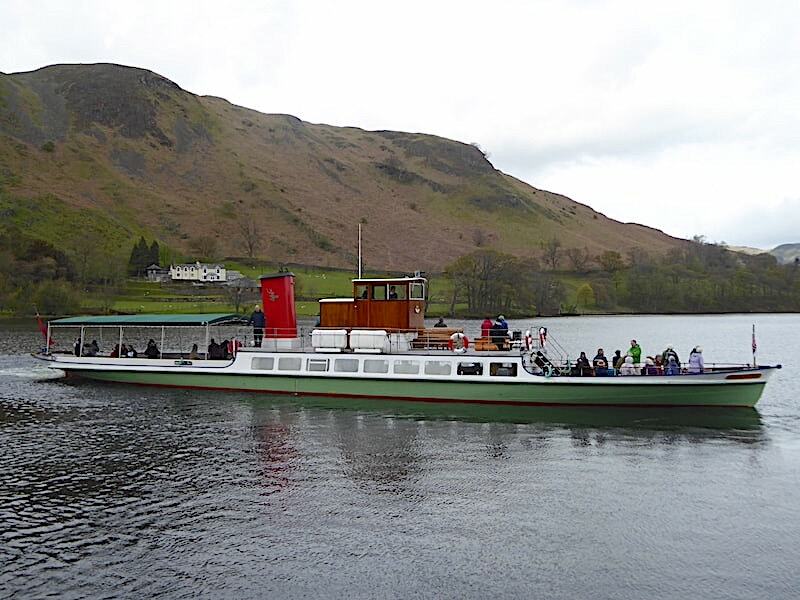 The Lady of the Lake backs away from the jetty having disembarked eighteen passengers at Howtown, no we didn’t do the counting we heard one of the boat crew doing so, leaving the enclosed saloon section still full of coach passengers with a few more having to brave the chilly wind on the open decks. 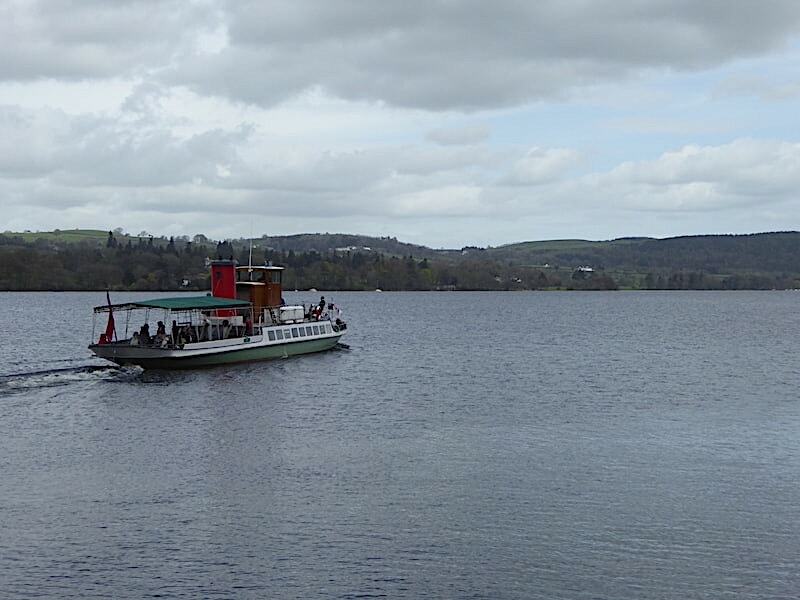 The ferry heads off to Pooley Bridge with the cloud cover heading in the same direction so its goodbye to the sun and the blue sky. 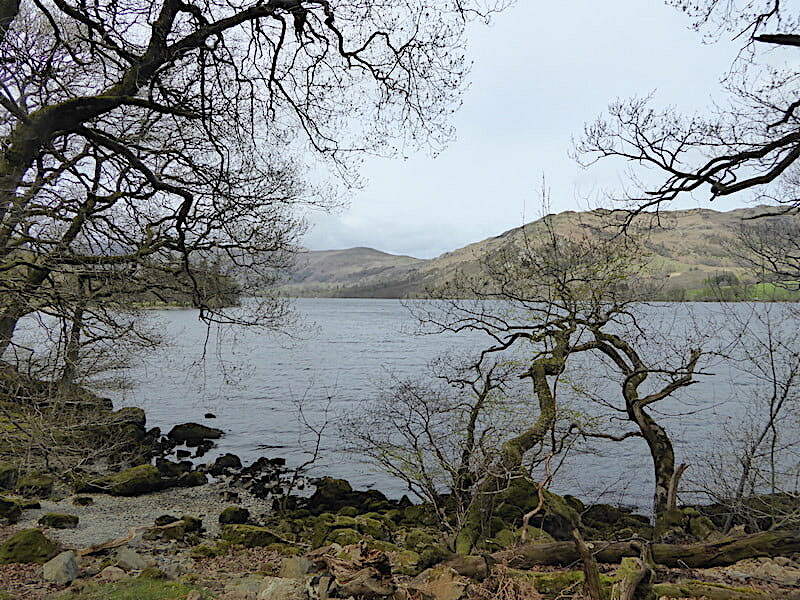 Hallin Fell sits serenely above the wash left by The Lady of the Lake and we are left alone on the now deserted jetty. Time to get ourselves going too as its a bit nippy standing here with the wind sweeping along the water. 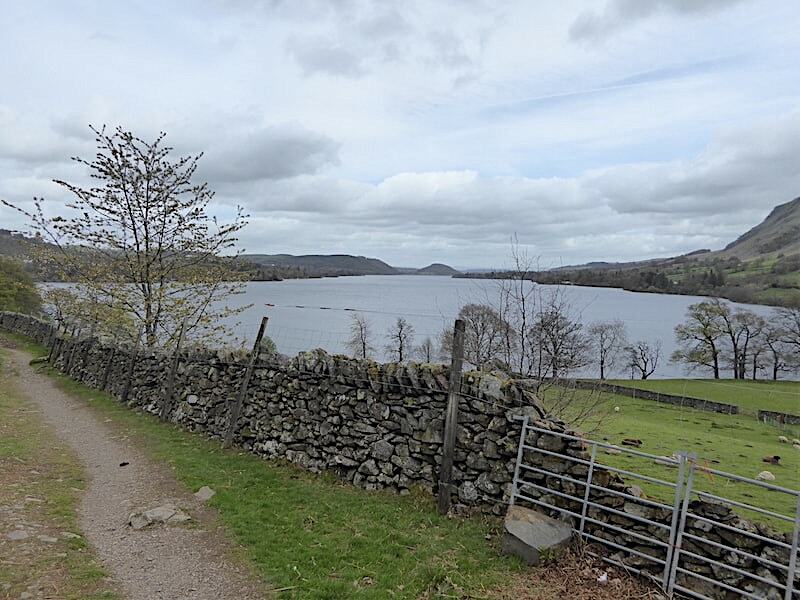 At the end of the jetty we follow the signs for Sandwick and head along the lane towards Hallin Fell …..
….. with a look across to Steel Knotts over to our left as we do. 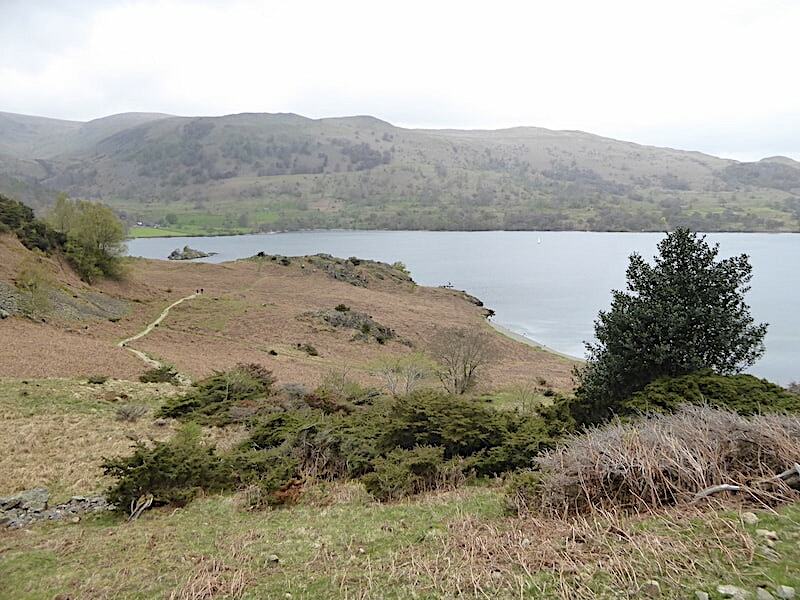 From the lane the path takes an upward turn over a short section of pitched stones to a handgate in a wall where we turn right to join this path around the base of Hallin Fell with its view northwards along Ullswater. Just out of shot on the path ahead are three of the passengers who got off the boat at Howtown. We caught up with them quite soon afterwards, not that we were walking very quickly it was just because they kept stopping to take in the views. 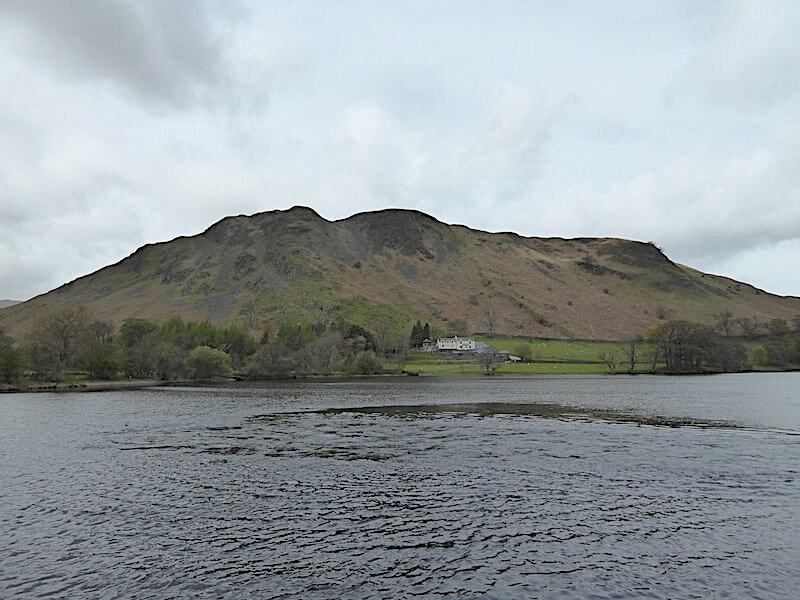 The grey clouds cometh over Arthur’s Pike and Bonscale Pike on the far shore of Ullswater. 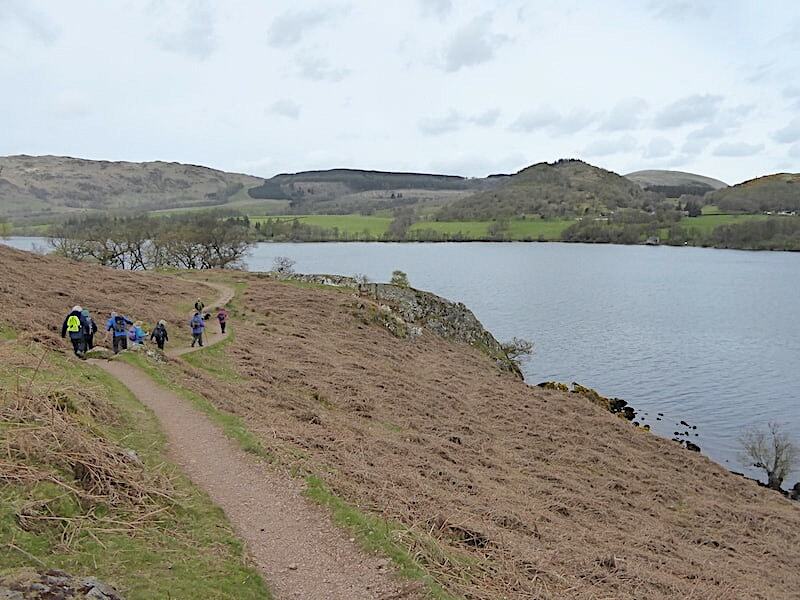 A group of eight walkers who also disembarked at Howtown approach Geordie’s Crag just ahead of us. They are well spread out but aren’t walking very quickly either and in no time we are right behind them. 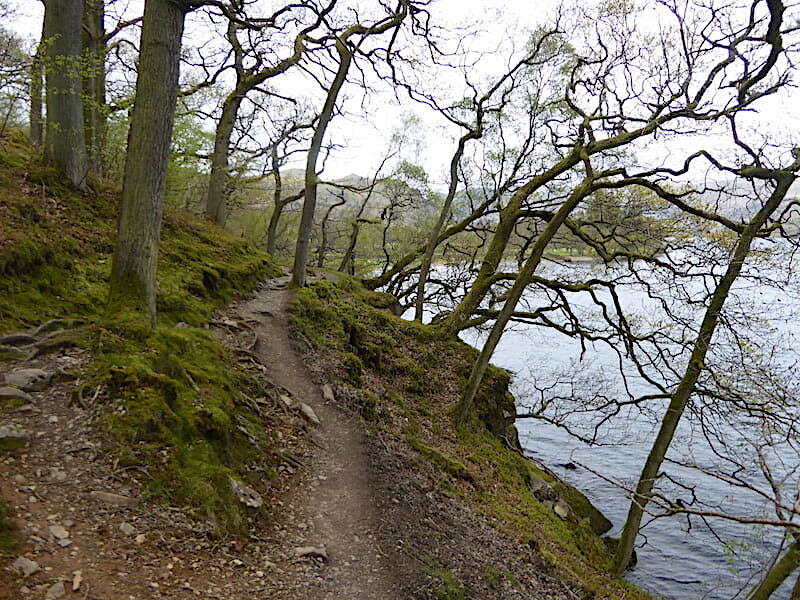 The narrowness of the path makes it difficult to get around them so we bide our time. A look along the water from Geordie’s Crag while the walking group negotiate the short rocky drop down to the shoreline path just behind me. 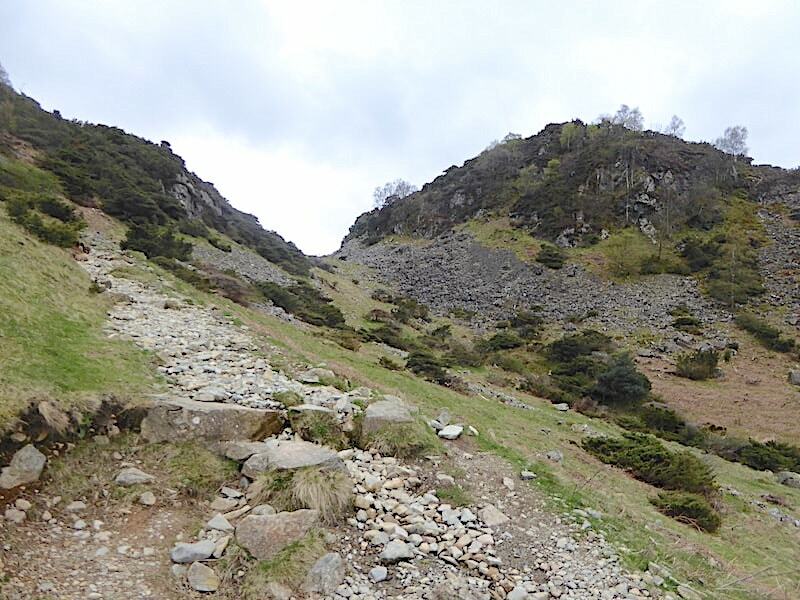 Once again the path is narrow and there is no opportunity to pass by until …..
….. we approach Kailpot Crag where the group leader pauses for everyone to catch up before going through the gate in the wall. We take the opportunity to nip up to the gate and pass through while the group gathers together. Beyond the gate and we continue on, without feeling that we are snapping at anyone’s heels, over the rocky shoreline path through Hallinhag Wood. 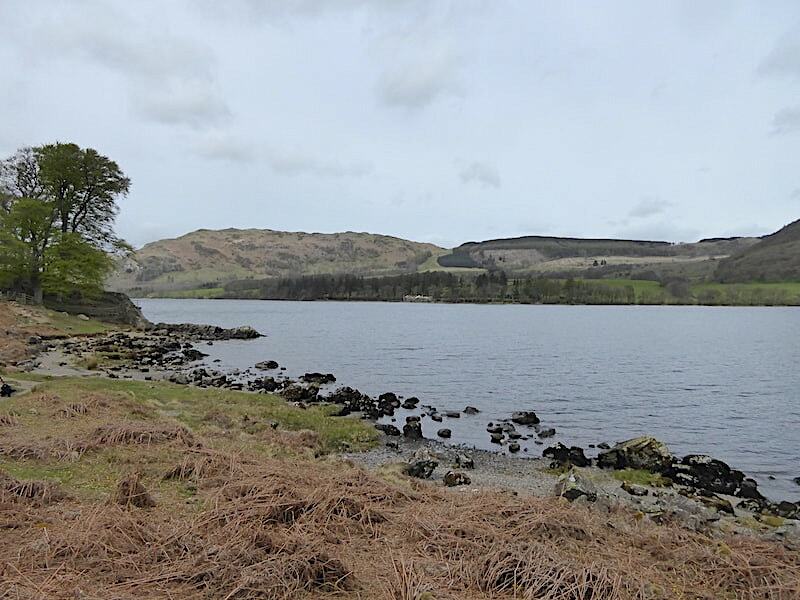 The path keeps quite close to the shoreline around the base of Hallin Fell so there are plenty of opportunities to get close to the water should anyone fancy a paddle or even a swim, its usually numbingly cold though. 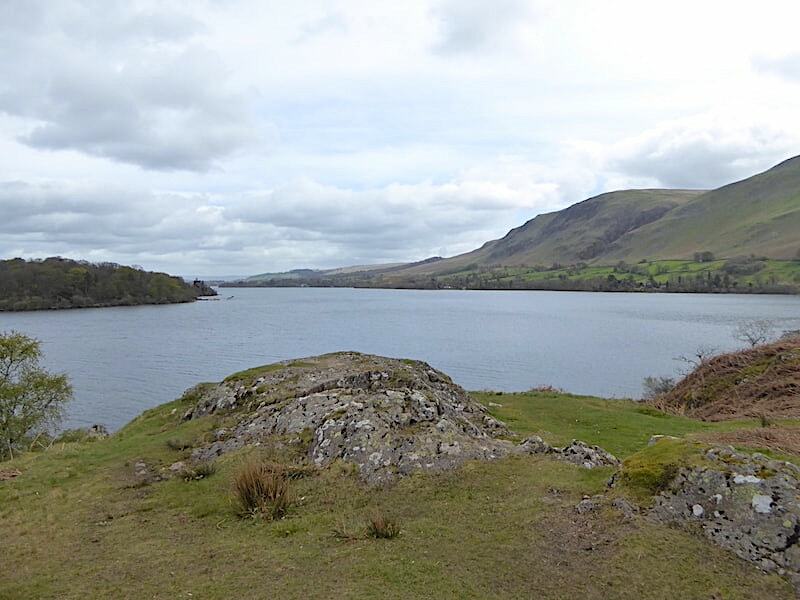 In the centre of the shot, beyond the water, is part of Watermillock Common, with Gowbarrow Fell to the right. 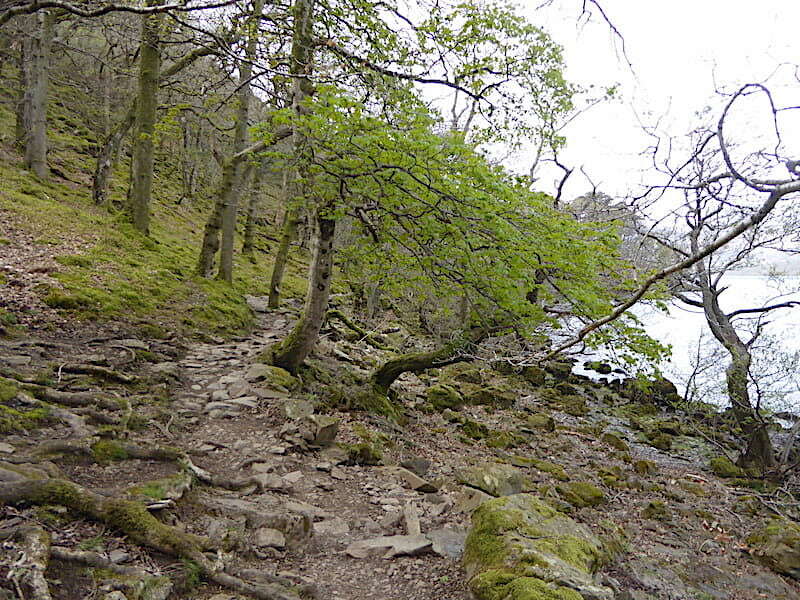 The path continues on through the woodland, with plenty of rocks and tree roots to avoid along the way, towards Sandwick Bay …..
….. where there is a very nice, but quite small, stretch of sandy beach. 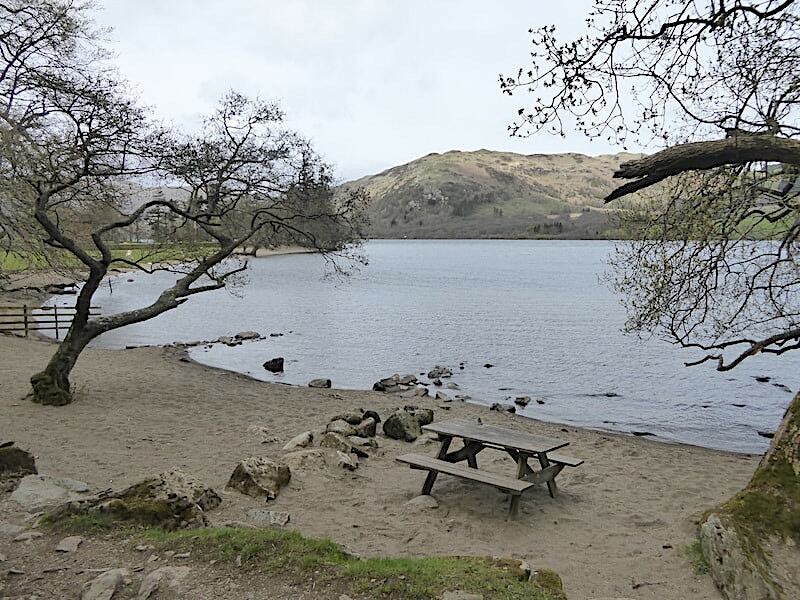 Lovely spot to linger on a scorching summer day, although it wouldn’t be as deserted as this as you might well imagine. Watermillock Common and Gowbarrow across the fields as we turn up the path away from the bay and cross several fields to reach …..
….. the wider track passing in front of Beckside Farm which leads up to the bridge over Sandwick Beck …..
….. from where I took this shot of the beck looking upstream. 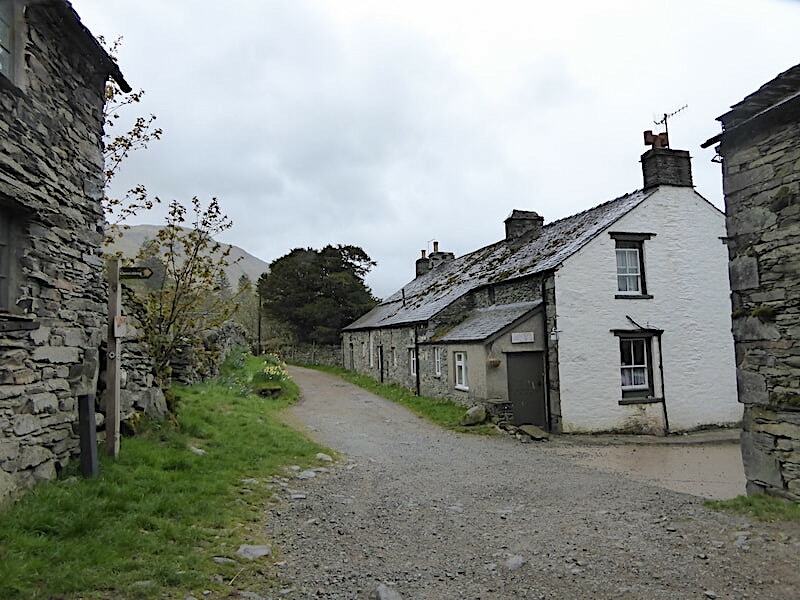 We go through the gate at the end of the bridge and turn left up the road in the little hamlet of Sandwick and up to …..
….. Town Head Cottage where we take the rough track running up alongside it. 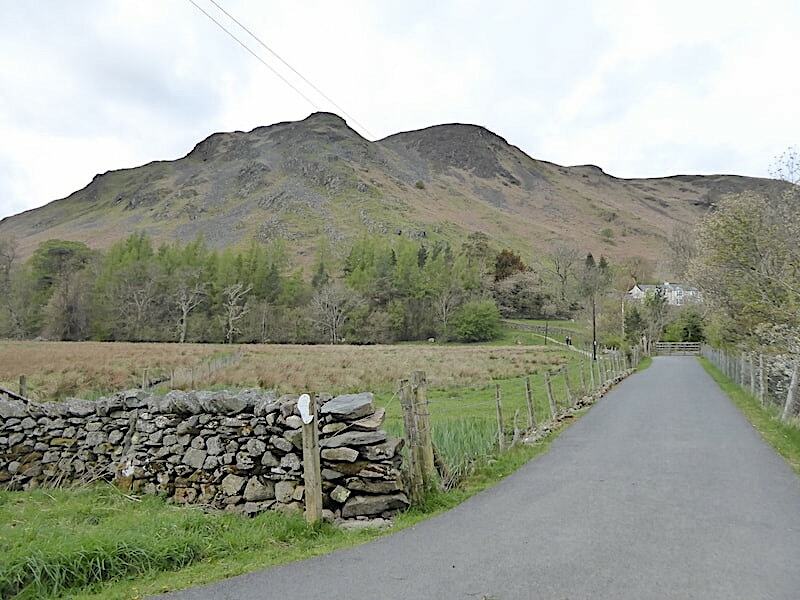 The track beside the cottage soon joins this wider one which comes up from the road into Sandwick which is the one we used on 24th March when we did our Place Fell Grand Tour. 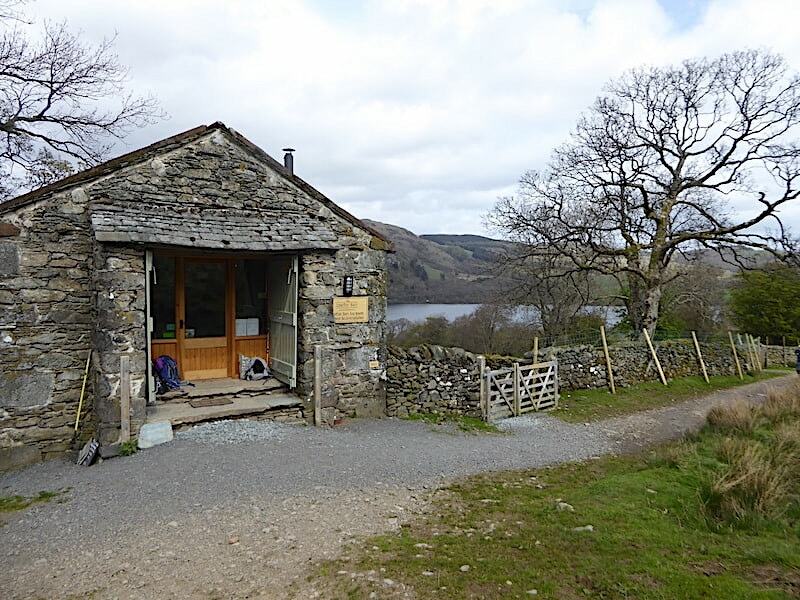 The Lowther Barn Tea Room with customers taking refreshments both inside the cafe and out in the little garden below the gate. 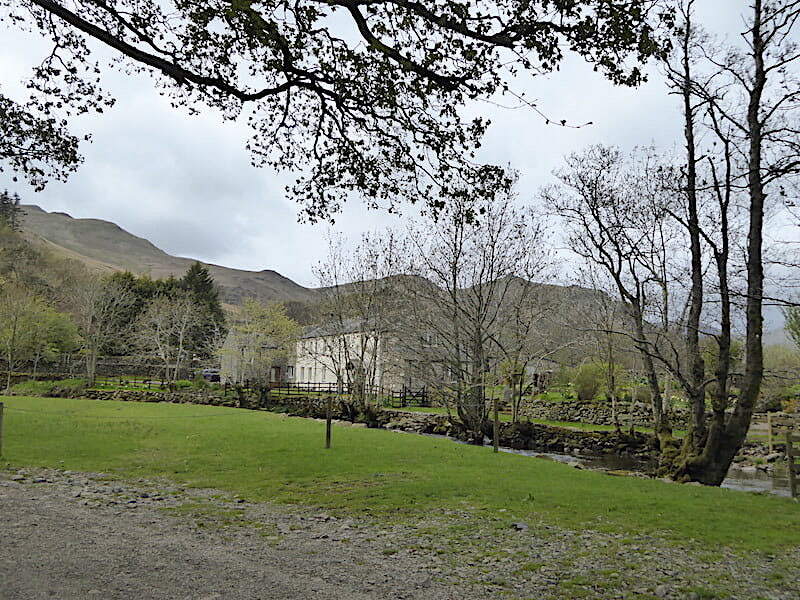 From the tea room we cross the little un-named beck close by it and make our way in the direction of Low Birk Fell on the right. 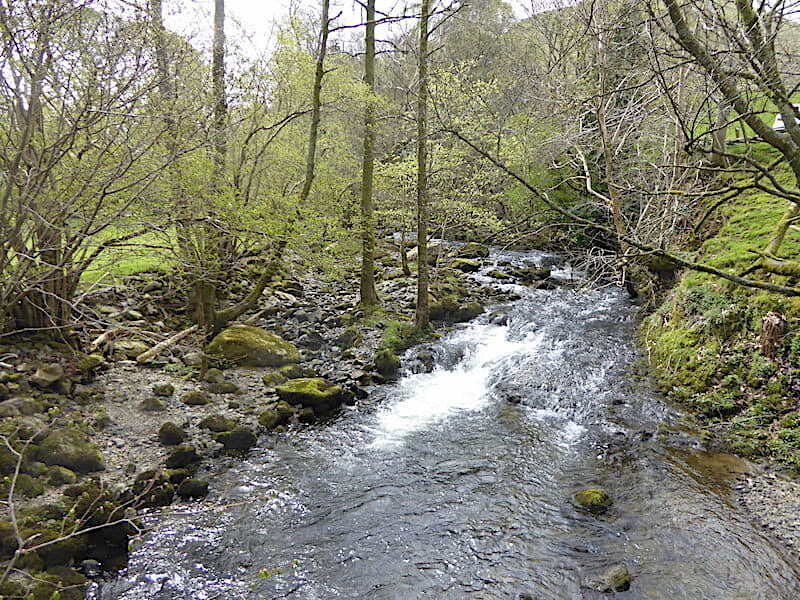 The bridge over Scalehow Beck is deserted today. 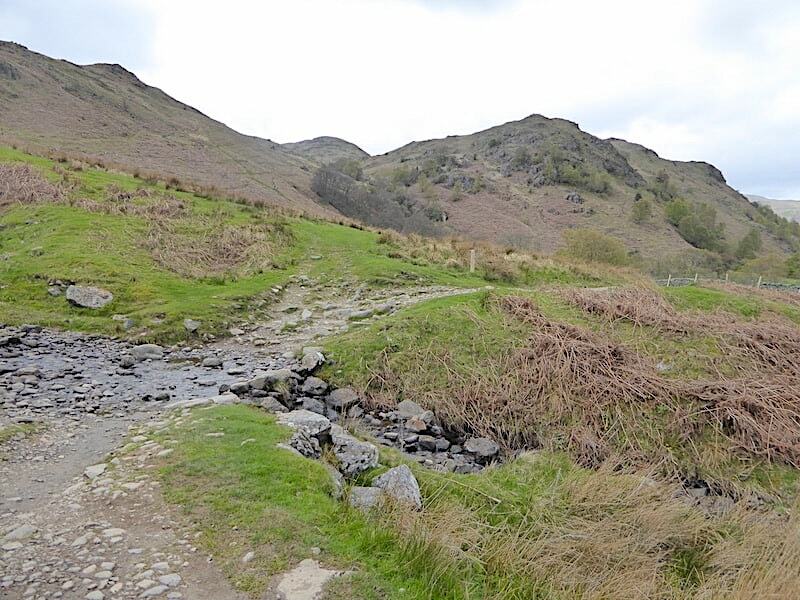 The path curves around to the left and begins to rise more steeply as it crosses over the slopes of Long Crag from where …..
….. there’s still a view of Scalehow Force with High Knott over to the left. 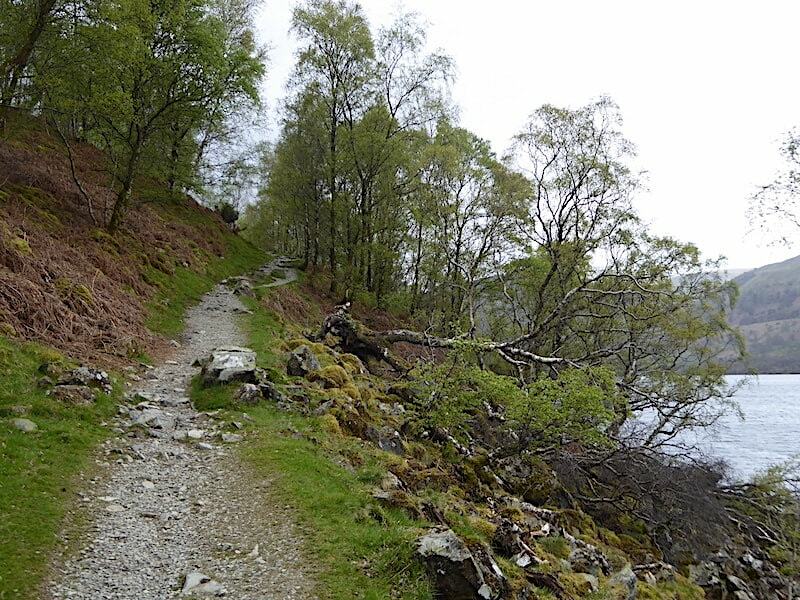 After the climb around Long Crag the path drops down and levels out once again and we have a spell of walking over the open fellside below Kilbert How. 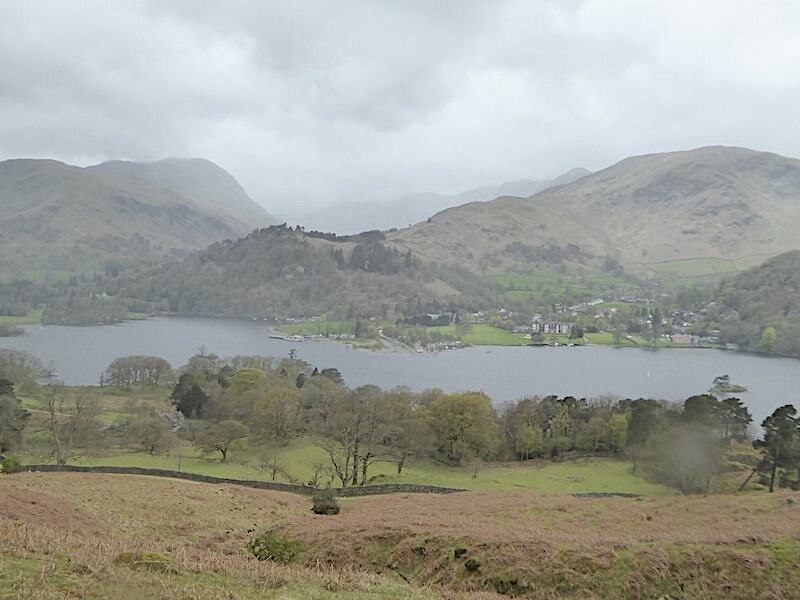 The view back along Ullswater would be improved by a splash of sunlight but none is on offer, the clouds have thickened and darkened and we keep feeling the occasional spot of rain. A little further along now with Watermillock Common on the skyline ahead with the woodland below the slopes of Birk Fell just beginning to come into view. The path begins to rise once more as it passes through the woods and we begin to hear young voices shouting and laughing although we cannot see anyone at the moment. Further along the source of the merriment comes into view. A group of youngsters afloat on the water, canoes lashed together for stability with the instructor shouting out one, two three in a vain attempt to get some sort of synchronisation into their paddling technique. Some got the hang of it, others didn’t so plenty of paddles were banging into each other with lots of laughter as a result. Great fun being had by all, well maybe not the instructor but the kids were certainly enjoying themselves. A clear view over to Glenridding Dodd and Sheffield Pike from a treeless high point just before we reach Silver Point, that’s the little promontory jutting out into Ullswater on the left hand side of the shot. 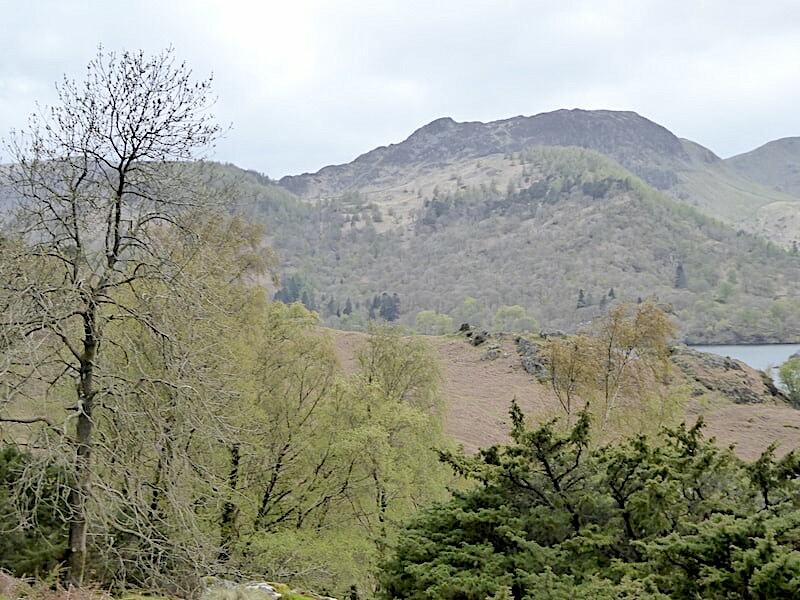 Birkhouse Moor and the pointed top of Catsty Cam can be seen on the skyline just above Glenridding Dodd. A closer look at Sheffield Pike and its subsidiary peak of Heron Pike. 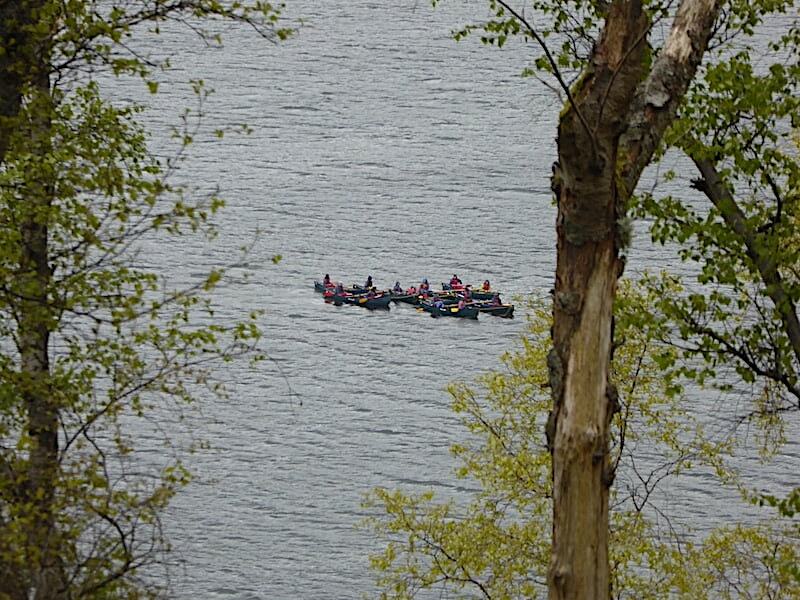 The group of trainee canoeists, still doing lots of shouting and laughing, testing their skills below us in Silver Bay. The small shingle beach in Silver Bay is a little larger than the one back in Sandwick Bay. 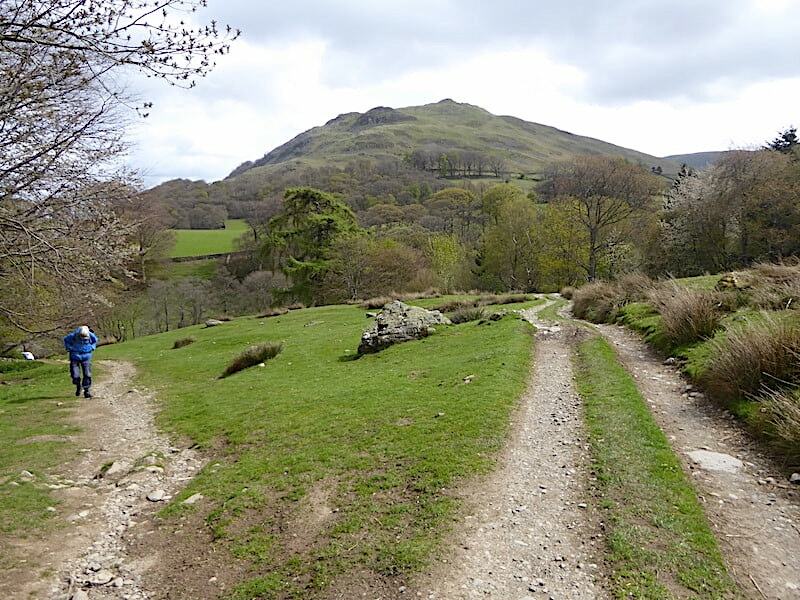 We had left the main Ullswater Way path a little further back and turned off to the left up a pitched path which rises steeply …..
….. to the little col between Birk Fell, rising on the left, and Silver Crag over on the right. We have always continued along the main path on previous occasions so today we decided to follow this one and do a bit of exploring. 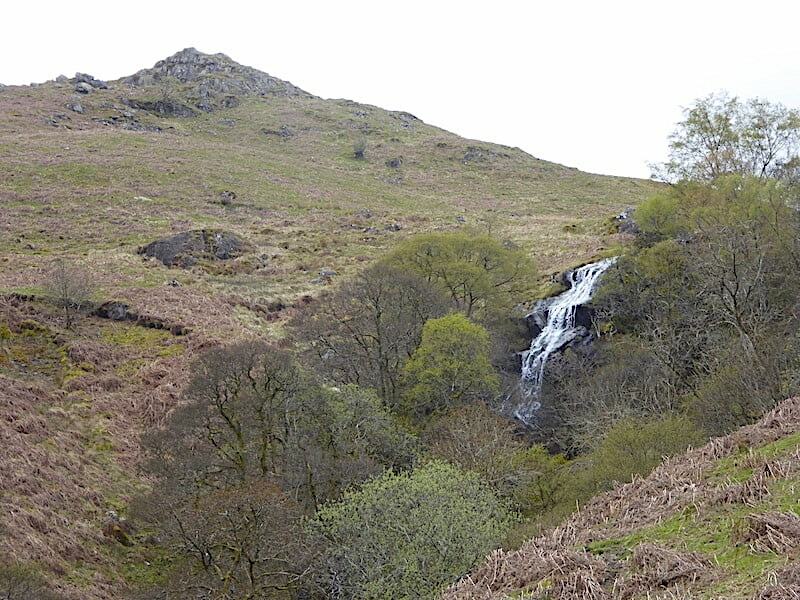 Its a grand little spot, juniper bushes everywhere and no difficulties to deal with, and the plan was to climb up onto the top of Silver Crag and have our lunch break there and enjoy the views. But the best laid plans …..
….. were about to be ambushed as the rain began to fall in rather more serious and copious quantities. 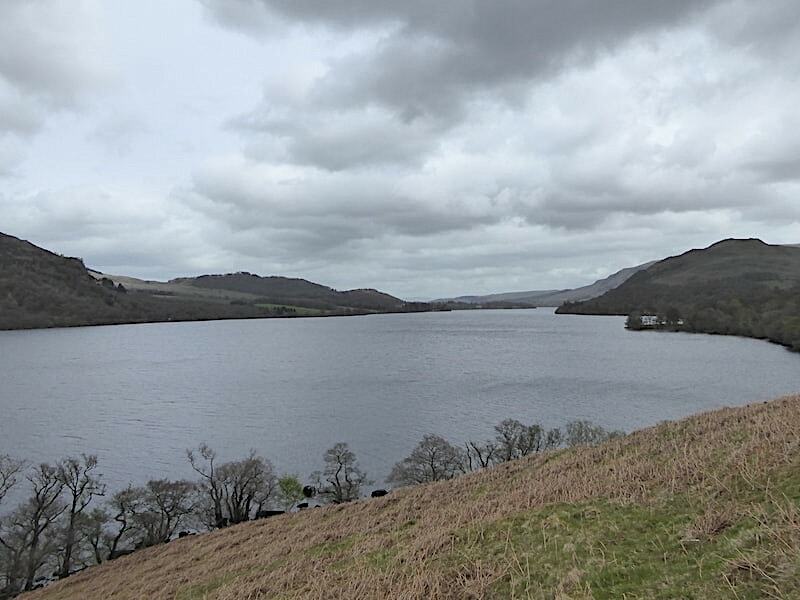 Below a couple of walkers have just donned waterproofs before continuing along the Ullswater Way path around Silver Point. 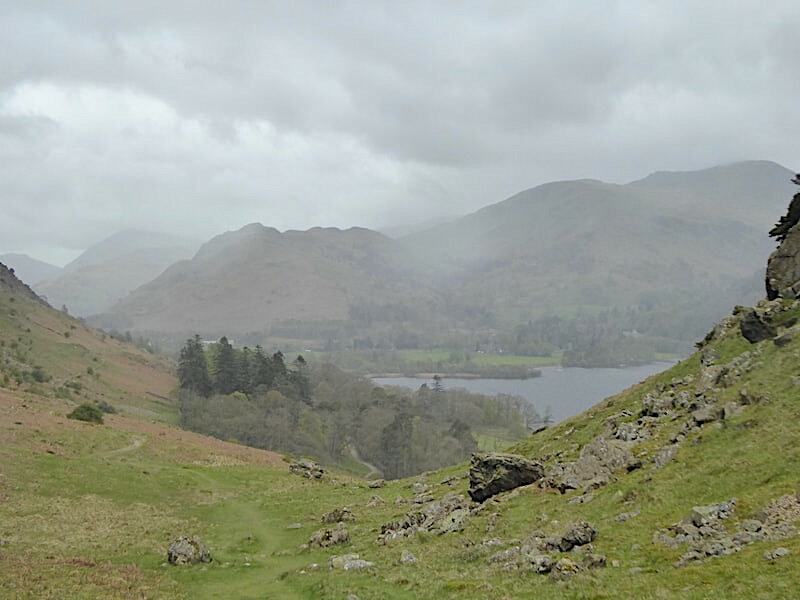 The sky and the water drops on the camera lens tell the story so we abandon the notion of a picnic lunch atop Silver Crag and carry on up to the col …..
….. from where there is this lovely view of rain bucketing down on Patterdale. 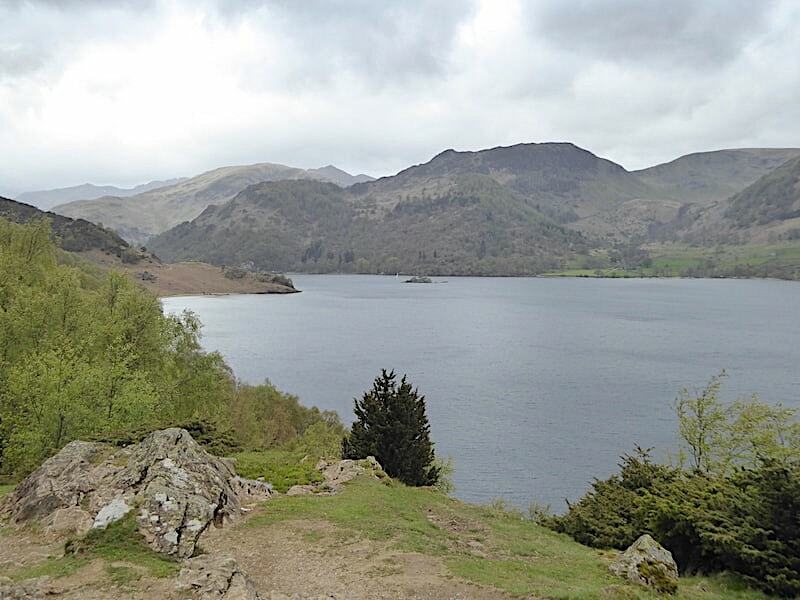 The fells which are just about visible across the centre are Arnison Crag, Birks and Saint Sunday Crag. 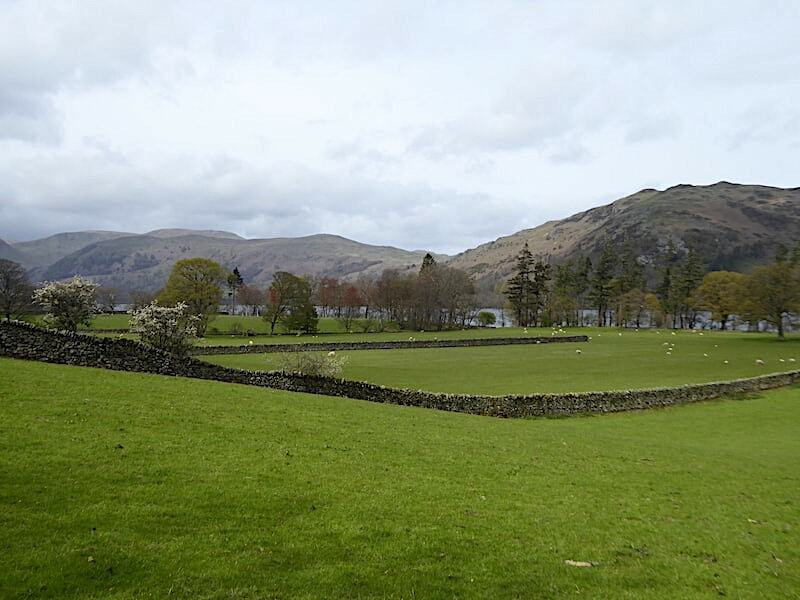 From this point there is a lovely grassy path stretching ahead of us which eventually leads us down to Side Farm. 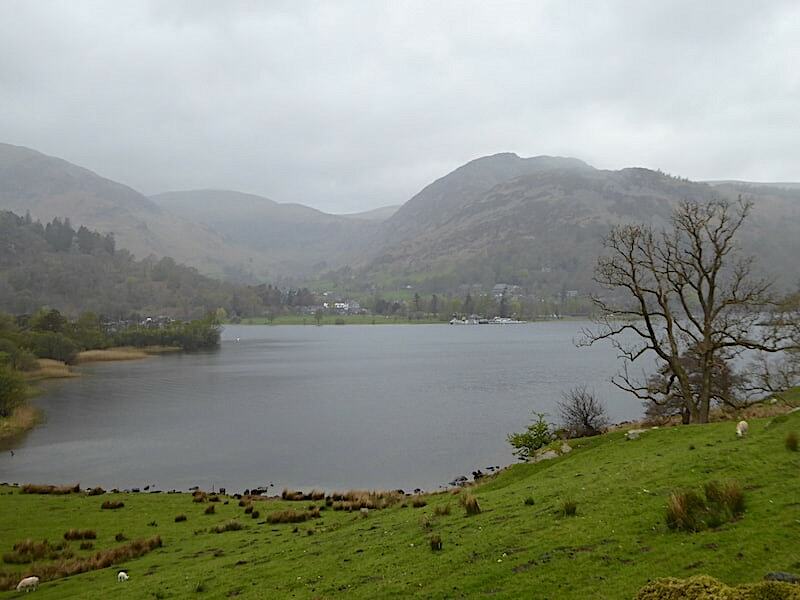 We draw level with Glenridding on the opposite shore so I get the camera out again. No matter how much I tried to prevent the drops landing on the lens they still managed it so I gave up and put the camera away again. I console myself with the thought that as everything is shrouded by the rain clouds there’s nothing much to see anyway. Trying once again now we have some protection from the wall beside the path leading us down to Side Farm. 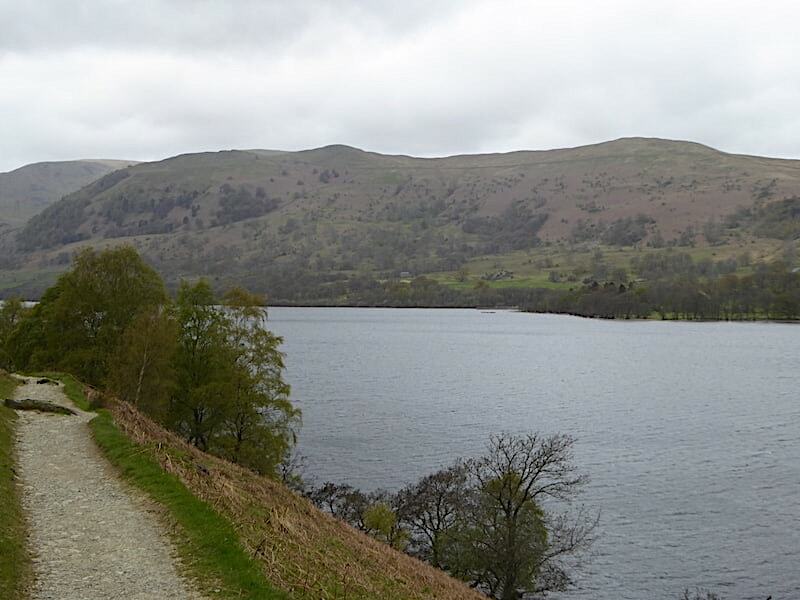 Our final destination is Glenridding Pier, which can just be seen on the far side of the water below Glenridding Dodd and Sheffield Pike, so we still have some distance to cover and its still chucking it down. 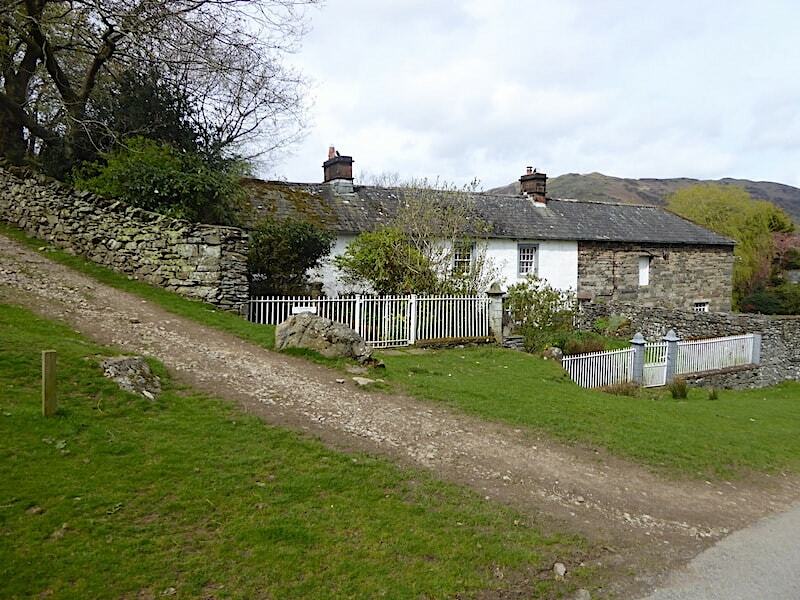 Down at Side Farm where we turn right through the farm buildings and walk along the farm track which brings us out at the George Starkey Hut beside the main road in Patterdale. 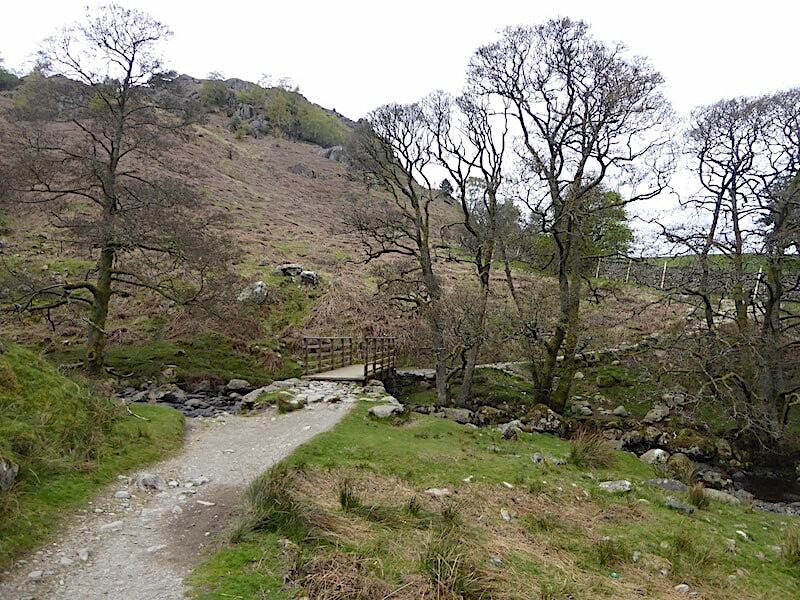 From there we turn right and follow the road back into Glenridding. 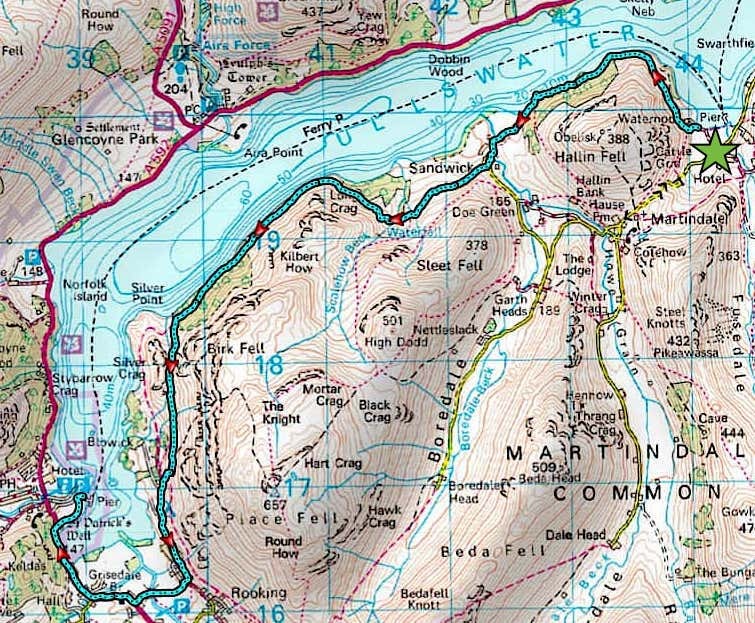 There are footpaths along the road which keep walkers away from the traffic although it is necessary to cross from one side of the road to the other at regular intervals and the points at which this needs to be done are clearly indicated. Its a busy road so watch out for traffic as you cross. 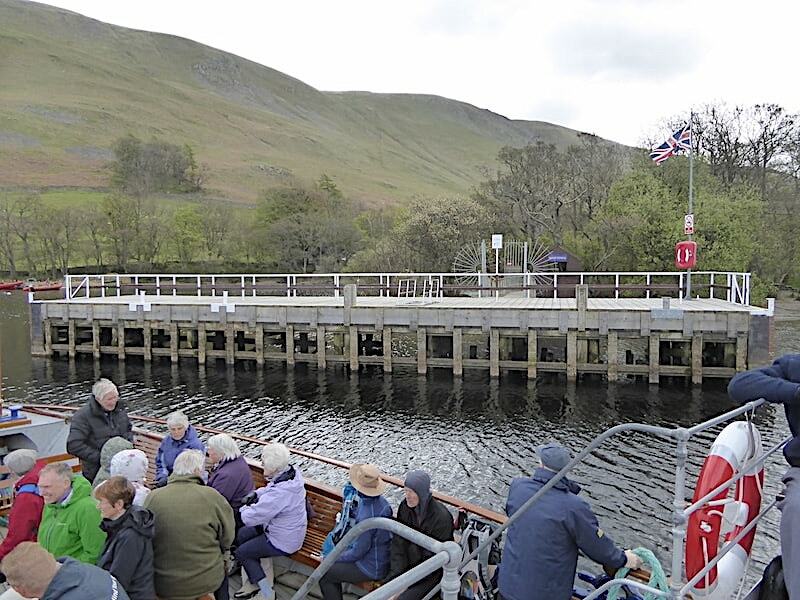 It continued to rain so from here the camera went back in its case until …..
….. we got back to our starting point at the pier where another group of passengers is waiting to get on board for their afternoon trip along Ullswater. The rain has slowed to a steady drizzle but, as the flag indicates, the wind is still whipping along the water so we ignore all the vacant benches in the field and head straight for the car and our long overdue lunch break. Naturally, the minute we settle in our seats, lunch boxes at the ready, the car windows steam up and we can see nothing at all. Oh well, that’s more or less how the day went anyway, at least the sandwiches were tasty. 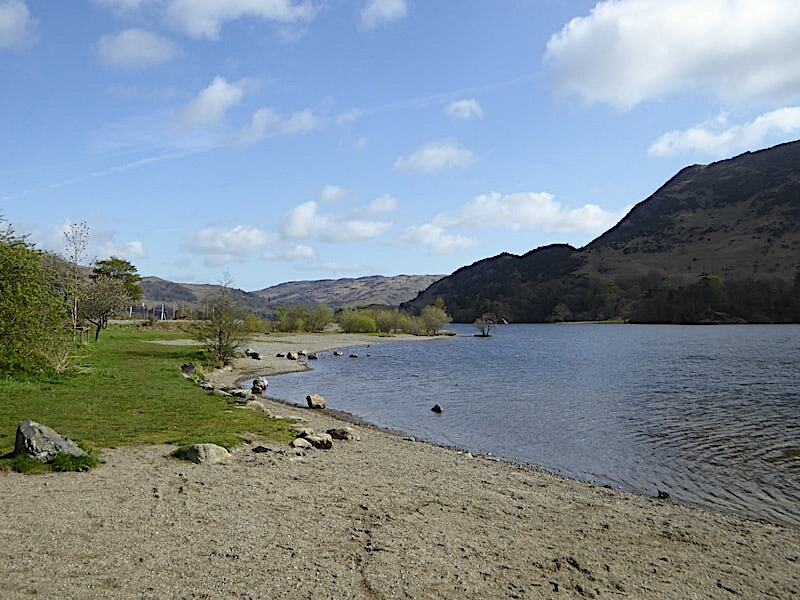 According to all the forecasts the coming Bank Holiday weekend looks likely to bring a spell of fine weather so that’s something to look forward to. PS – The back problems continue, but when all is well and back to normal I’ll be announcing it from the rooftops with a megaphone.